After my first visit to the New York Botanical Garden’s annual Orchid Show many years ago, I discovered that I LOVE orchids. Every time I see a store that sells orchids, I have to step inside and check them out. The orchid world is so massive and beautiful that I am constantly finding out about orchids I’ve never heard of or seen before. A note about photography on my blog: any photos, unless otherwise specified, are my own original photography. I am currently a Washington, DC resident, but I have not changed the name of my blog. Brooklyn is where I was living when I fell in love with orchids and started writing about them, so Brooklyn Orchids it shall remain. In case you’re interested, I also have a separate personal blog. I talk about beauty, skin care, pop culture…whatever strikes my fancy at the moment. You can check it out over here! I agree that Orchids are lovely and come in so many varieties. I have one that blooms about once a year with small purple flowers. I am a Zazzler also! Best of luck with your blog. I love your posts! I am starting to fall in love with orchids too! My mom’s office had a very sad/abandoned orchid, that only had one leaf and a few roots left. I have tried to trim all the dead roots and repotted a few times already and the roots continued to root. I also noticed some green bacteria growing on the root as well. I would like some advice from you since you have successfully saved some orchids! Hi Deanna, thanks so much for the comment! That’s awesome that you took in an abandoned orchid. I wonder if the potting medium is old. Do you know what type of medium it is – sphagnum moss, bark, etc? Sphagnum moss tends to stay moist for longer so if that’s what the orchid is potted in, you may want to consider switching to an orchid bark mix, which you can find at stores like Lowe’s & Home Depot. It’s hard to say what the green stuff is that’s growing on the root without seeing a photo, but it may be some kind of mold. How often do you water the orchid? Do you let it drain well when you water it? It’s in some sphagnum moss… maybe it’s old as it seemed to stay wet forever. I drained it but the moss still seemed really soggy. The most recent time I actually squeezed water out of the moss before repotting them, so it should be relatively dry. However, when I took out the orchid today, I see these green mold again. Perhaps the potting medium is too old and contaminated. Maybe I’ll try the bark mix. Do you think I need to bag it? How long does it take to see any root growth? There is only one lonely leaf on the plant but at least that leaf is still shiny. Thanks tons for your prompt response! Deanna, a picture would definitely help! If you upload your photos to a site like Flickr or Picasa, you can just post a link here in the comments for me to take a look. If not, you can email a pic to brooklynorchids [at] gmail [dot] com and I’ll take a look. Hi. Looking to send a friend who just had surgery a nice orchid. Having trouble actually finding someone in Brooklyn to order from – all of the Manhattan florists want to charge $40 to deliver! Do you happen to know of any good places in Brooklyn that can deliver beautiful orchids? Thanks! I’m not all that familiar with Brooklyn florists, but there are a couple places I know of in Park Slope that carry orchids. Blooms on Fifth, and Zuzu’s Petals. I have never ordered anything from either place so I can’t speak to their delivery costs. Some other places you can try are Dig (on Atlantic Ave), Graceful Gardens (in Williamsburg) and Chelsea Garden Center West (in Red Hook). Good luck, I hope you are able to find a place! I have a baby growing on an old “branch”. How and when should I remove it and how should it be planted? It’s biggest leaf is about 3″, and it have 2 roots. I found your web blog and found it quite interesting. I am a orchid hobbyist located in the Caribbean (Barbados) to be exact. 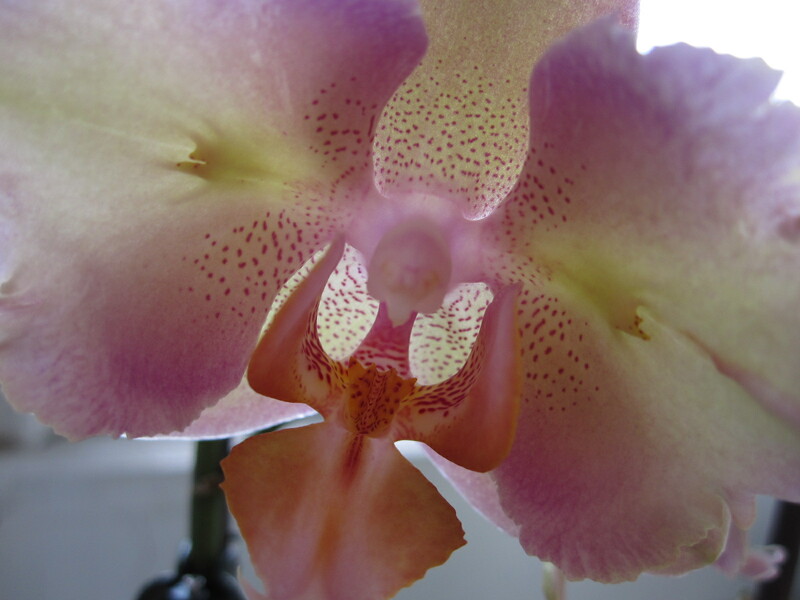 I would like to know if you would be interested in showcasing some interesting orchid hybrids I will be developing. If you are please do contact me at [email protected]. I will be breeding hard cane Dendrobiums and some really cutting edge Cymbidiums. I am sure you will love and appreciate them and perhaps your readers as well. Hi I’m in need of desperate help with one of my plants. I honestly don’t know what to say its doing, I have a picture but it pretty much has roots and new leaves growing at the end of an existing shoot that bloomed two flowers….do you know what this is called and what I should be doing for it? Hi Vee, it sounds like you have a keiki, which is a baby orchid that grows off of the mother plant. If you’d like, you can remove the keiki from the mother plant when it has 2-4 roots that are at least 2-3 inches long. Then the baby plant can be potted on its own! Or you can choose to leave the keiki on the main spike and allow it to grow bigger before removing and repotting. I’m going to try and repot my orchid (my first time doing this) and was wondering where I might be able to get the bark mix and moss to do this. I live in Park Slope near intersection of Flatbush and 6th avenue. Do you know any good places to buy the supplies near here? Hi! I don’t know of any good stores right by there, but the Lowe’s in Gowanus is not far away and they have orchid bark mix and moss. It’s on 9th Street near Smith and is a quick walk from the F/G/R trains at 4th Ave/9th St. Thanks! Will head over there. Thanks so much, Vickie! I appreciate it!! Very helpful. Enjoy your “less technical” terminology. USEFUL TOO. Early last fall I rescued 2 withering Phal’s from my local Kroger’s flower shop. They had been marked down to $1 each and their next stop would have been the dumpster. Seeing them there, I had the same feeling I’d get if a cold wet kitten suddenly showed up on the door step. I had to take them home. One of them the entire stem had already turned brown and was dried out. The other the leaves had started to wrinkle, but still had a couple flowers managing to cling to the stem. I took them home and immediately gave them a good soaking for a few hours in tepid water, drained them well (they are in bark so that was easier than if they’d been in moss) and set them on the window sill in my east facing kitchen window. Once a week I put 3 ice cubes in each of their pots for water. They seem to enjoy their window sill because the poor fellow that lost his stem has a lovely new Merlot colored leaf standing tall in his center and I’ll be excited to see what color flowers he produces when he finally grows a new stem. The other, with the wrinkled leaves, eventually did lose two leaves, but now, the remaining leaves are nice and smooth and he’s started sprouting a new spike, as well as new roots pushing up. These are the only orchids I’ve ever owned, but I’m so pleased that I could save these two from the rubbish. Now I keep watching to see if they have any more that need rescued. Since I have found your blog I will return often to see what’s new. It’s a lovely site with lots of good information. Thanks for being here. I was given three “mini Phalaenopsis” orchids. They are in moss. I put them in water once a week and when the moss is completely wet I squeeze out the excess water (gently) and then they sit in an east window. They seem to be doing fine – fresh roots growing leaves a healthy, shiny deep green. The frustration I have is the fertilizer. I have been using an “Orchid Food” 19-31-17. I find that the mixing directions are not user friendly. The portions are strange also the directions will say put 7 g in 2.5 L of water and the scoop that is given says 1/4 teaspoon on it. I generally guestimate the proportions. I have also read that it should be a balanced fertilizer a 20-20-20. The directions on this container have – mix 6mL of the fertilizer with 5L of water. (I have a 4L container which would be 4.8 mL fertilizer but how do I measure 4.8? -why don’t they use something more common for their measurements? even a 1L container is more common) I find that the mixing directions on either container are not user friendly. The portions are strange. I have also read that you should use the fertilizer in 1/2 strength. Basically I want to fertilize for the health of my orchid as well as wanting them to bloom again. Do you have any suggestions to my fertilizer quandary? I’ve always loved orchids and finally bought my first one over the weekend. After puchasing a phalaenopsis orchid I realized I had no idea how to care for one. The flower shop I purchased from did not give me much information other than to not overwater, but it didn’t tell me how to water either. Your blog has been so helpful over the past few days learning how to water and what I need to do to keep my orchid healthy and happy. The photos help a ton as well for knowing what healthy vs. unhealthy roots look like. Thanks! Last year, I bought a phalaeonopsis from my grocery store which i kept watering even though it didn’t look like it was going to bloom again. But against all odds it did! and i now have a spike of gorgeous light purple flowers. i hope i am not going to jinx myself by asking this, but this spike has been in bloom for a while (about 2.5 – 3 months now), in contrast to the new orchid plants i have bought, whose flowers have begun to wilt off after a couple of weeks. so, did my old plant just come from good stock? how do i keep the flowers of the new plants from falling off after only a couple of weeks? Unfortunately there isn’t really anything you can do to keep the flowers from falling off. If you want to have blooms for a longer period of time, you’ll want to look for orchid plants that have at least some unopened buds at the time you buy them. This will ensure that you get the plant at the beginning of its blooming period. When you buy an orchid that is fully in bloom, you won’t know how long it has been in bloom for and it might be almost ready to drop its flowers. Sounds like that’s probably what has happened with the new orchids you’re talking about. I love your blog. I have always loved orchids and early last year took the plunge and bought one. My collection has now grown to 12 orchids. I am very new to the orchid game and have found your advice very helpful. I am in South Africa and our beautiful climate makes growing the orchids some what easier as I do not have to use any artificial lights or heating. I have lost a few along the way and hope to one day have a full orchid garden. Dear Sarah, I love your website. I save all the ideas in a folder. Hi – I lost contact with your site when you moved AND I got a new email address! glad I ‘found’ you again and can follow your posts and ask questions! I started with 2 Phalens about 3 years ago and now have 6 large ones and 4 ‘minis’ – all 6 of my large ones are in bloom at the same time right now! don’t know whay THAT happened, but it did, although one I almost done!